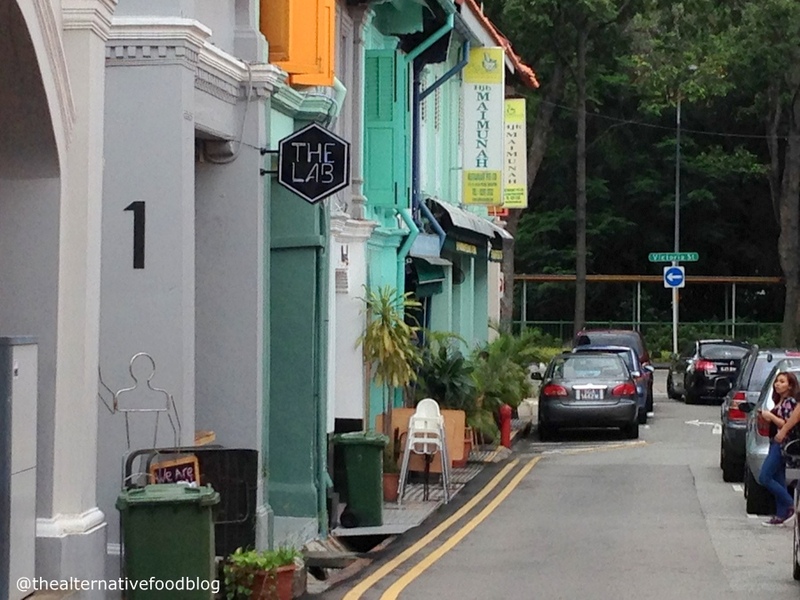 Jalan Pisang is fast becoming the street where you can go to be guaranteed a gastronomical adventure. Regardless of whether it’s Padang food you want from Hajjah Maimunah, phở from Pho 4 All or even just the need to satisfy the sweet tooth in you with Fluff Bakery’s baked goods, there’s so many different choices for you to choose from. 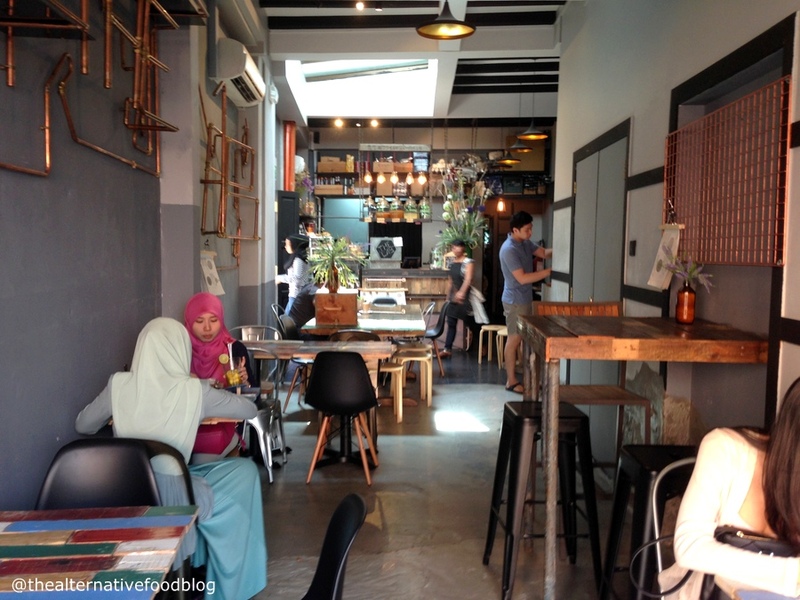 Joining these eateries is The Lab, a newly opened Muslim-owned cafe. I first visited The Lab with a friend of mine on a weekday afternoon and again that same week on a Friday because my usual foodie buddies, Kit and my cousin, Yasmeen, were intrigued by the photographs I had sent them and wanted to see this place for themselves. After I introduced Kit to The Lab, she eventually went back with some of her ex-colleagues to try out more dishes too. 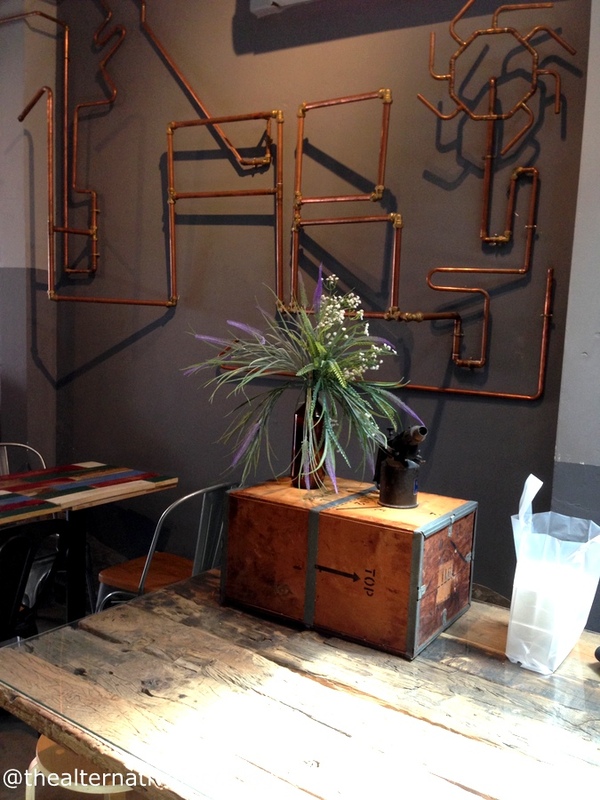 As with many new cafes, cafe owner Ijah shared that their design concept is very ‘on the go’ with almost every single thing in their store being things they have recycled and made from hand. 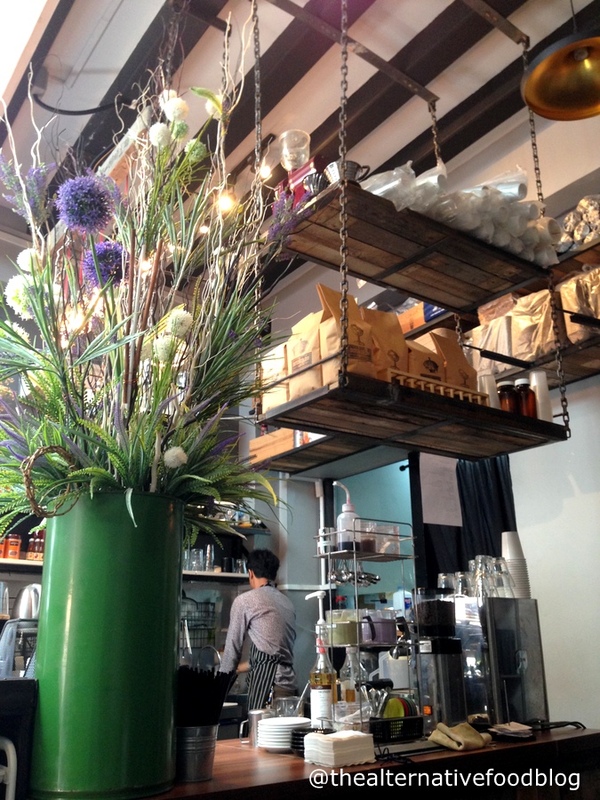 What I love when visiting cafes is taking time to appreciate how much time, effort and love has gone into curating the right pieces of furniture and accessories for each cafe. After all, these cafes are often the brain children and lifelong dreams of many individuals and it definitely shows in their decorations of the cafe. 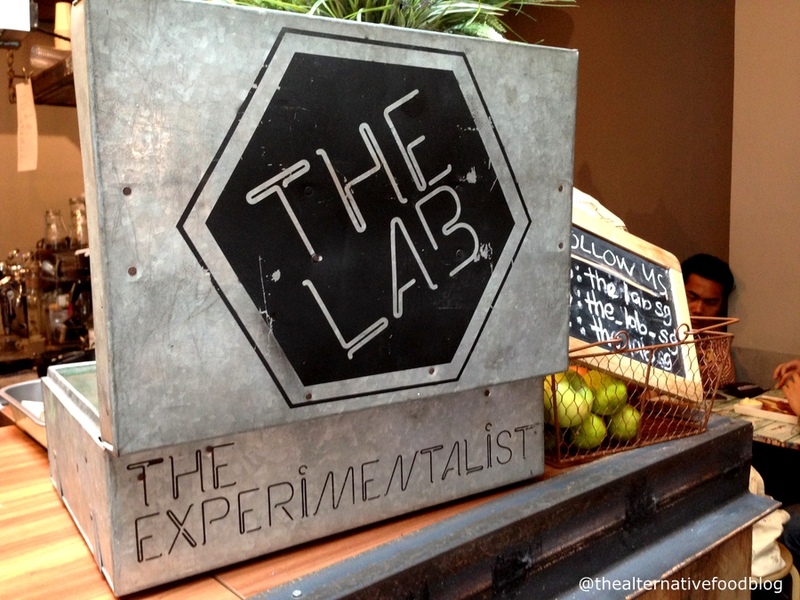 While you won’t find mad scientists running around with test tubes and Bunsen burners, you will however find that this cafe is very understated in its branding of itself as ‘The Lab’. 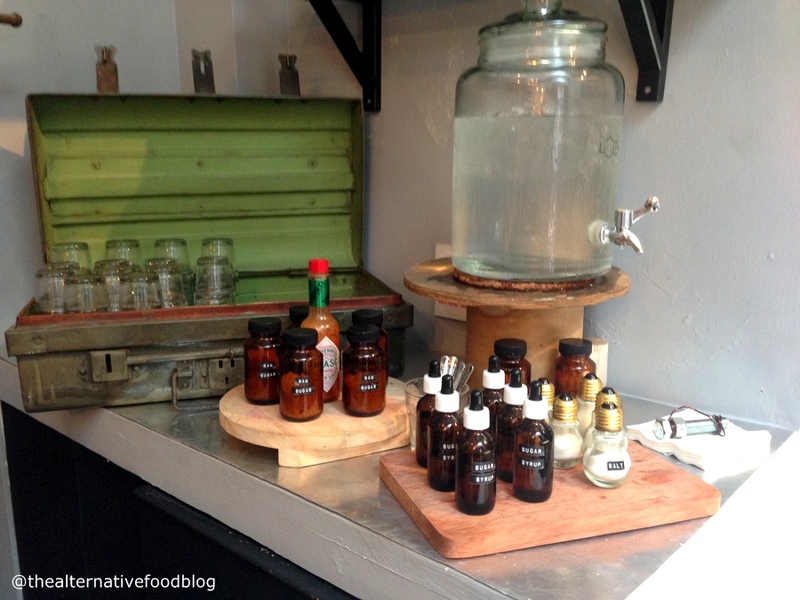 You’ll see little quirky bits around the cafe that suggest that a lot of thought and love was put into branding ‘The Lab’. 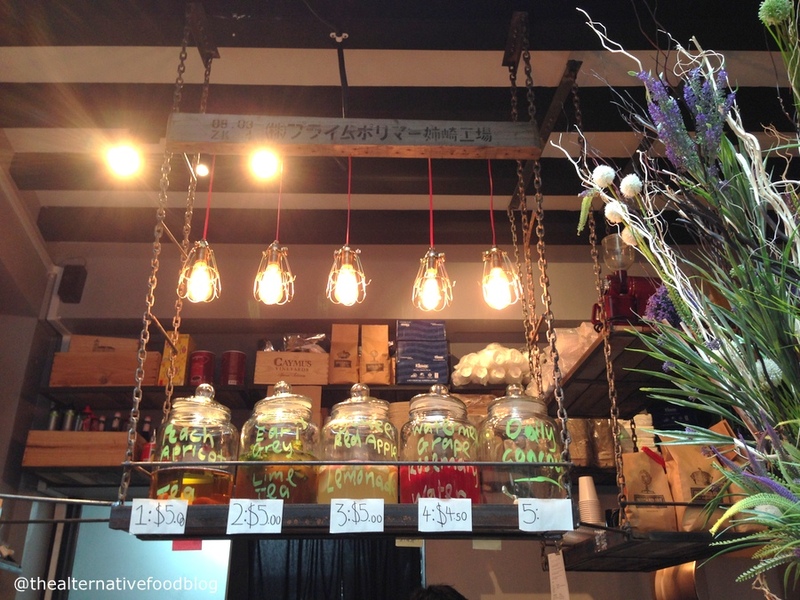 For instance, their juice jars come with atom structures that scream science, copper pipes on the wall subtly spell out the cafe’s name and there are even little jars and tubes containing sugar and salt which are definitely a unique feature to The Lab. A quick look at their menu told me that a lot of their dishes were heavily influenced by Eastern Europe which is a concept I’ve yet to see in any halal certified or Muslim owned cafe in Singapore. 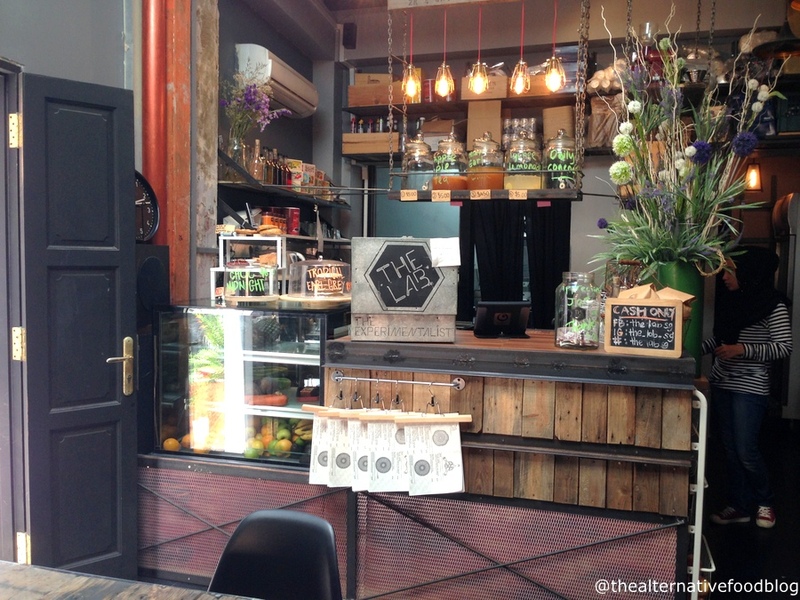 However, the bigger stand out for me was the numerous vegetarian-friendly dishes that this cafe had listed on their menu and I knew that Kit and I had to try these dishes because in all honesty, there are not that many cafes that are so vegetarian-friendly and we really wanted to showcase this with our review of The Lab. 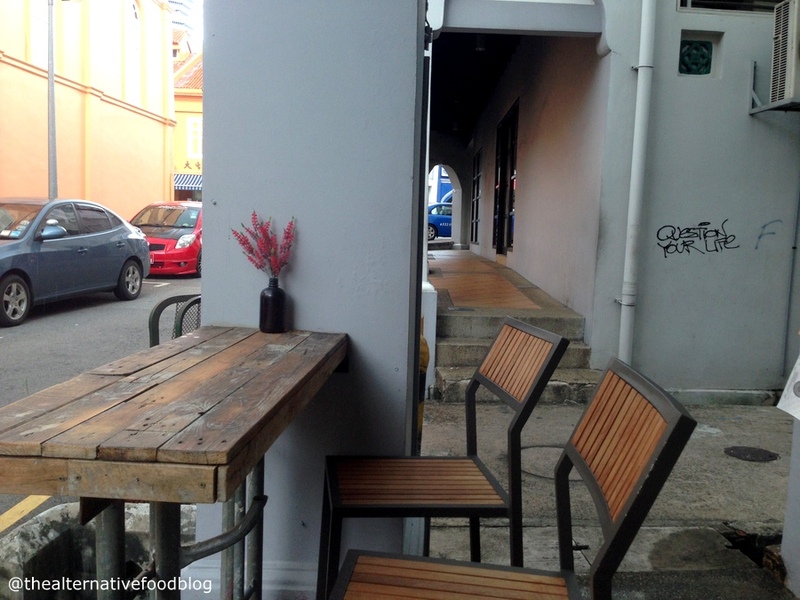 The first time I visited this two-week old cafe, my friend and I ordered a Black Eyed Pea Burger (SGD $9.90) which Kit later ordered when we visited the cafe together, a Hungarian Goulash (SGD $16.90) and a Terefrank Buffalo Wings (SGD $8.90) and I also had their in house juice Fibre My Dear (SGD $7.00) and a Lychee Red Apple Lemonade (SGD $5.00). On my second visit, I ordered for myself the De La Huerta (SGD $12.90) while Kit had the Black Eyed Pea Burger and we also shared an entree of a pair of German Bretzels (SGD $4.90) and we found ourselves ordering a Sea Salt Brownie with Ice Cream (SGD $7.90) and we washed it all down with a serving of An Apple A Day (SGD $7.00) as well as a Pear-Mango Basil Sparkler (SGD $6.00). Kit and I both tried the Black Eyed Pea Burger which is a vegetarian burger consisting of a 6 oz Homemade Vegetable Beans patty with grilled onion, arugula and tomato coulis and came served with a side of purple and orange sweet potato fries. First and foremost, for $9.90, I personally think that this burger definitely packs a punch. The burger falls under their ‘Cobbler’ section, and I had initially assumed it was smaller in size in comparison to the mains but this was definitely not the case. Kit and I both enjoyed the burger though I felt it was a tad bit sweet. 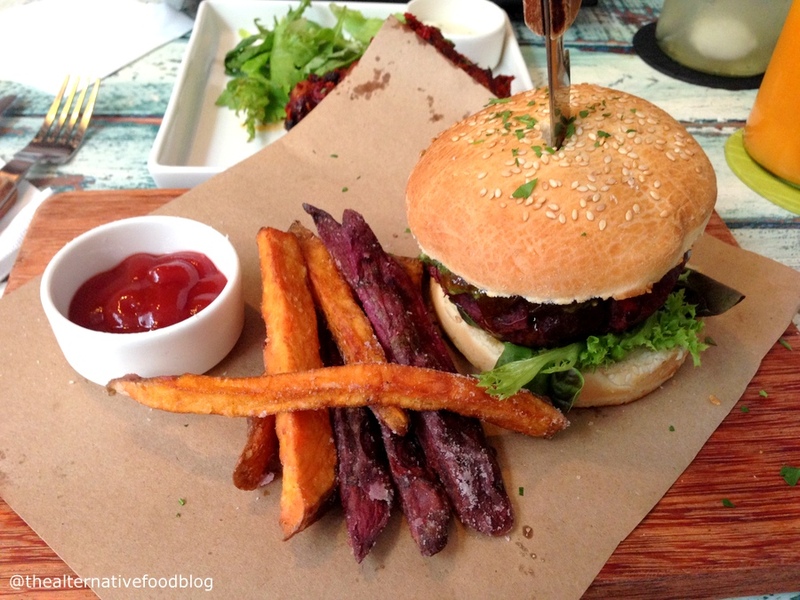 Although it wasn’t listed on the menu, I do believe that the patty is made with purple sweet potato as well. That plus the combination of grilled onion did make the dish a little bit sweet for me but it wasn’t something that stopped me from eating the burger. I personally thought that this was a completely different take on a vegetarian burger and I was definitely impressed with the creativity. 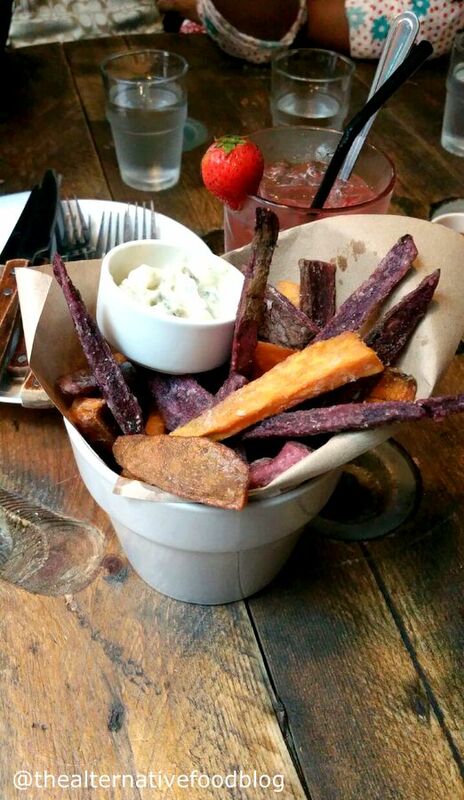 I must say that their sweet potato fries were on the money – crisp, crunchy and very fresh indeed. Later, Ijah shared with us that they hand cut their fries and do not just use generic sweet potato fries because they want to keep all their ingredients as fresh and natural as possible. On my second visit, I tried the De La Huerta, which is my favourite dish so far. I was slightly worried that the bell peppers might be overdone because I had assumed that they would roast it over the open fire like all other stuffed bell peppers and my fear continued to grow when the dish was set in front of me and Kit and I got whiffs of a burnt smell in the air but a quick check showed that my bell pepper was still taut and firm (not gooey and soft as with overcooked capsicum). Lately, my diet has gravitated more towards vegetarian options and I was thoroughly impressed with my dish and I even sent my compliments back to the chef because I really enjoyed it. The De La Huerta is a grilled bell pepper dish that is stuffed with wild mushroom and oozy cheese and served on a pesto sauce with capers. 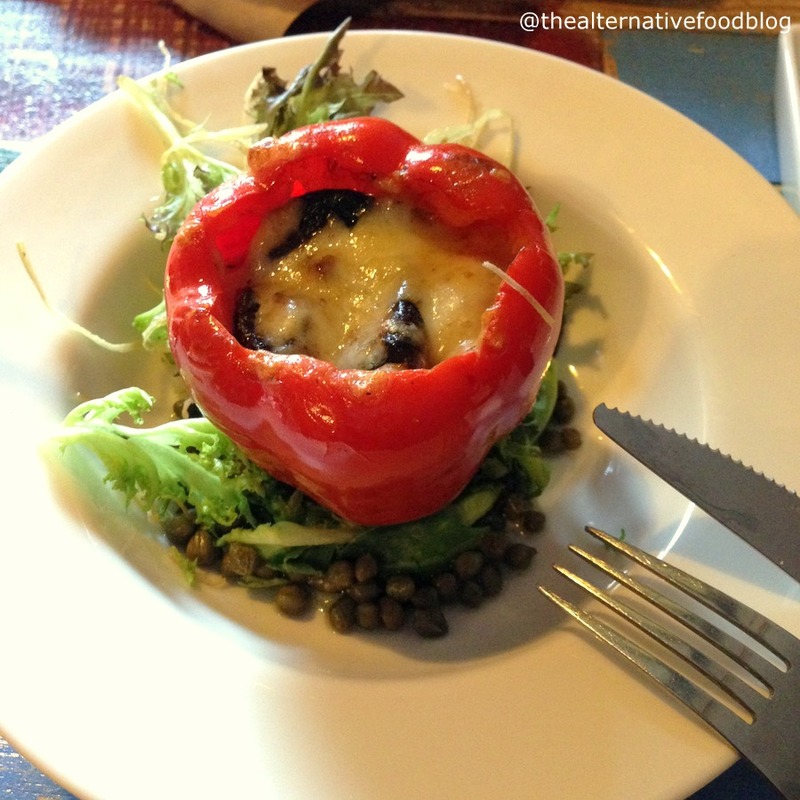 I loved the creamy stuffing in the bell pepper which was very reminiscent of a flavourful creamy pasta sauce but with a generous serving of cheese which melted so nicely and added a nice stringy element to the dish. That mix plus the pesto sauce sealed the deal for me and my only gripe was that I wished there was more stuffing for my bell pepper. I devoured my dish so quickly I was left with half a bell pepper and no more pesto sauce or stuffing. I didn’t really pick up the capers as I was eating and was happy anyway so perhaps, the capers were not really a game changer for me. 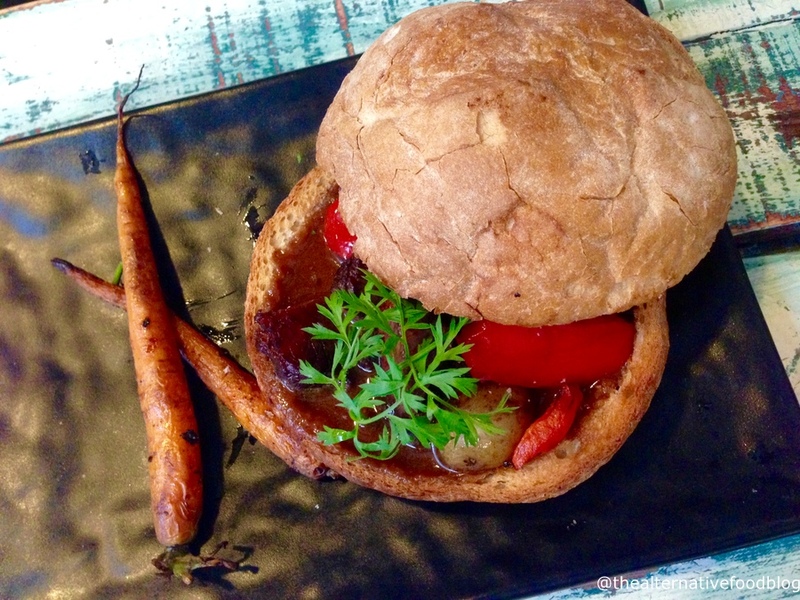 When I visited the cafe with my friend, she ordered a Hungarian Goulash which is a beef stew dish served in a crusty bread bowl and accompanied by some grilled Dutch carrots. She enjoyed the stew dish and thought that the gravy was well balanced with just the right amount of spices. Despite it being very heavily spiced, she didn’t think it was overpowering. Her only constructive criticism was that the beef could have been a little bit more tender. but other than that, she enjoyed the hearty dish. 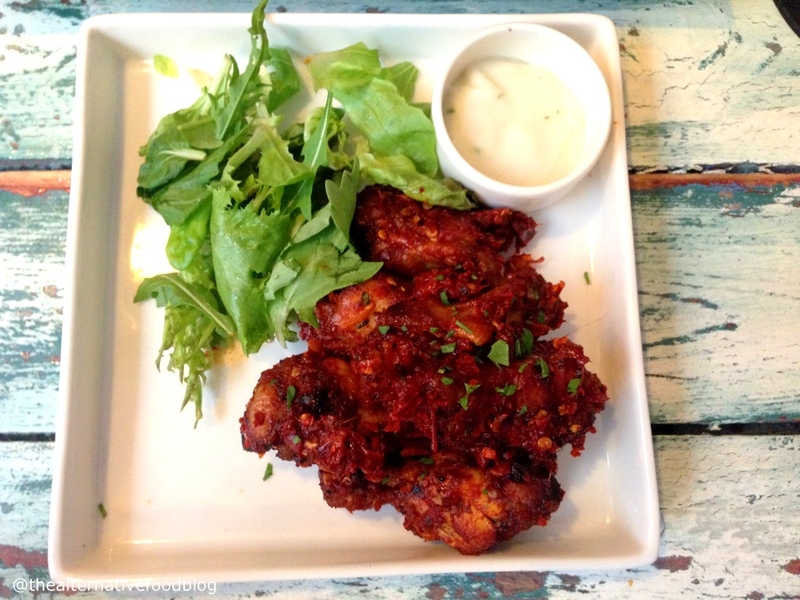 On top of this, during the same visit, my friend and I shared a side of Terefrank Buffalo Wings which come with your choice of sauce (either Lychee Sweet Chilli or Blue Cheese Dip) and you can pick your level of spiciness. I thought this dish was very reminiscent of the Kepak Bing Bing that you can get at Badoque. It was probably a milder version of its Badoque counterpart even though my friend and I went for ‘Wild’ on our chilli level. We completely forgot about our cheese dip and only remembered it after we had finished our meal. The cheese dip that I got was much lighter than I had expected it to be. I had assumed that the blue cheese would be quite a strong element in this dip but I was surprised to find how light and un-blue cheese-like this was. To me, the wings worked well even without the dip so I didn’t really feel like I was missing anything. Kit’s subsequent visit to The Lab with her friends saw them trying more dishes from the menu. 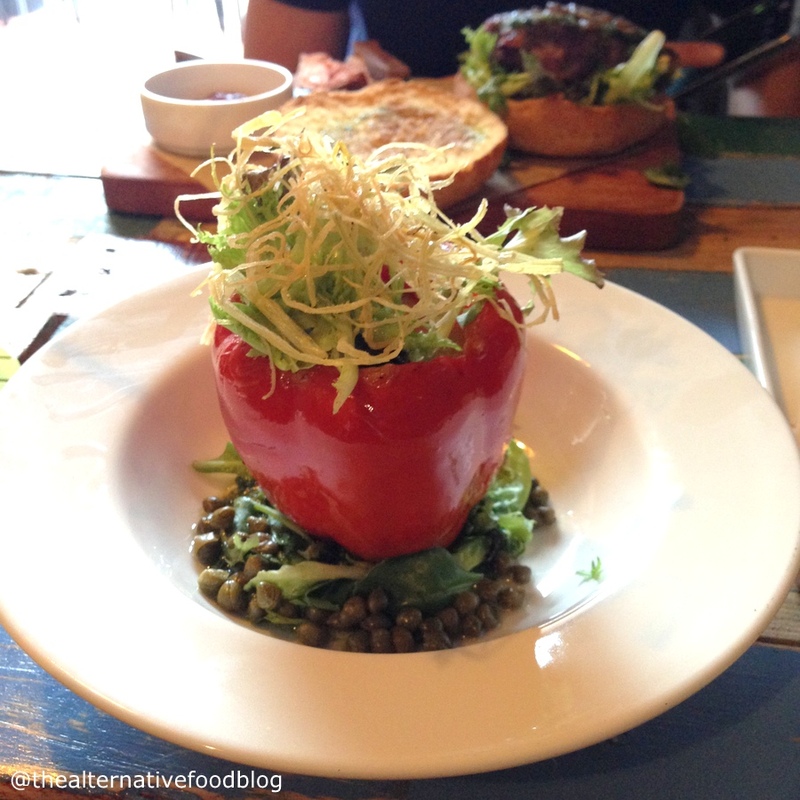 While Kit ordered a De La Huerta, one of her friends ordered the Classic Beef Burger (SGD $11.90). 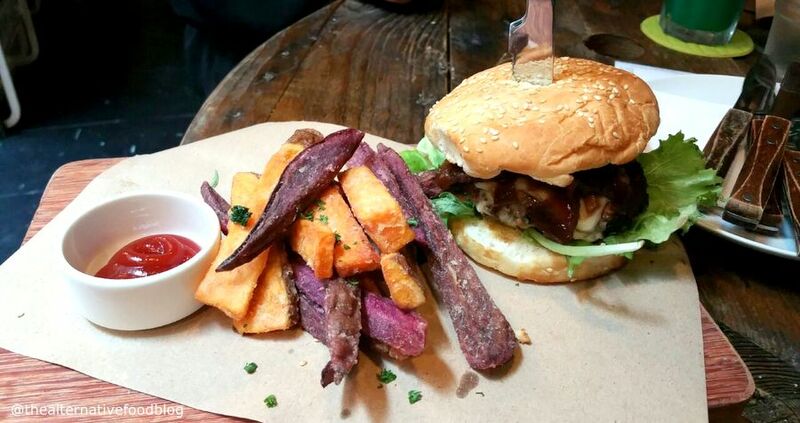 As the name suggests, the beef burger charms with it’s juicy 6 oz beef patty, mixed cheese, and caramalised onion, and like most of its mains, the Classic Beef Burger is served with a side of sweet potato fries. According to Kit’s friend, the beef patty was not dry and juicy enough, and the flavours were well-balanced, and she had no problem finishing the entire burger. 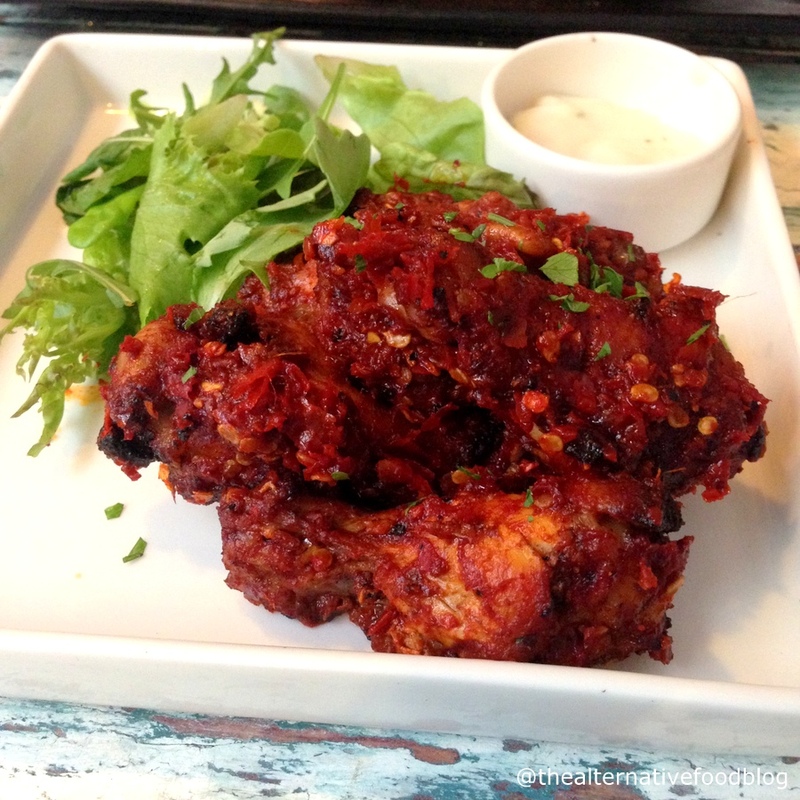 Another dish Kit’s friend tried was The Lab Chick (SGD $10.90). The Lab Chick is parked under the section ‘Cobblers’, and is similar to a grilled chicken sandwich. We were told by one of the wait staff that ‘Cobblers’ actually refers to bread in some countries in East Europe and thus, many of the dishes in this section feature bread heavily. 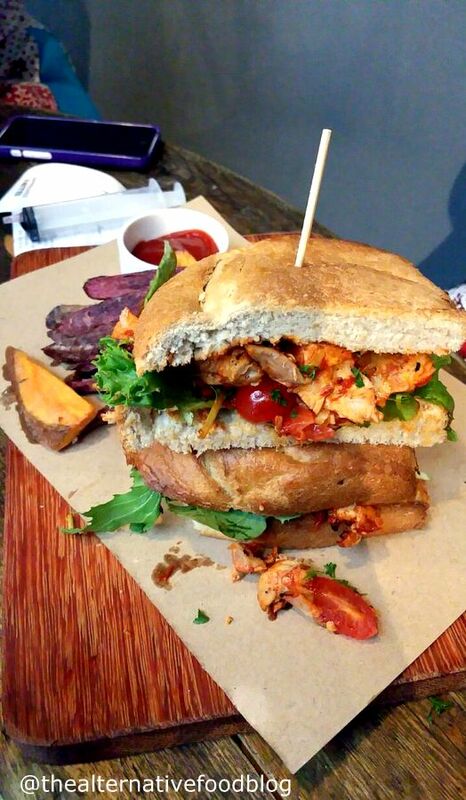 Chunks of cajun grilled chicken, along with salad greens and cherry tomatoes are served with sourdough bread, and not to forget, a side of sweet potato fries. The Lab Chick is similar to the other burgers in terms of its huge serving size. The chicken was grilled properly and the cajun spices, along with the sweet and tangy cherry tomatoes gave the sandwich its flavour. The sourdough bread was toasty and tasted delicious even on its own. Kit’s friend felt that the sandwich was too large for one to finish but otherwise, it was a sandwich worth trying. Of course, being a fan of sweet potato, Kit also ordered a side of Hand-cut Sweet Potato Chips (SGD $6.90) to share with her friends.Just as Ijah mentioned, the sweet potato fries are hand-cut and freshly prepared. These thick cuts of purple and orange sweet potato fries, with their skin on, are slightly crispy on the outside and soft and fluffy on the inside. The natural sweetness of the sweet potato fries are not overpowered by the house dip which tasted a little like the tartar sauce we are familiar with. These sweet potato fries did not become soggy and oily even when they are cold, and is definitely a healthier choice to the usual fries or wedges offered in most cafes. 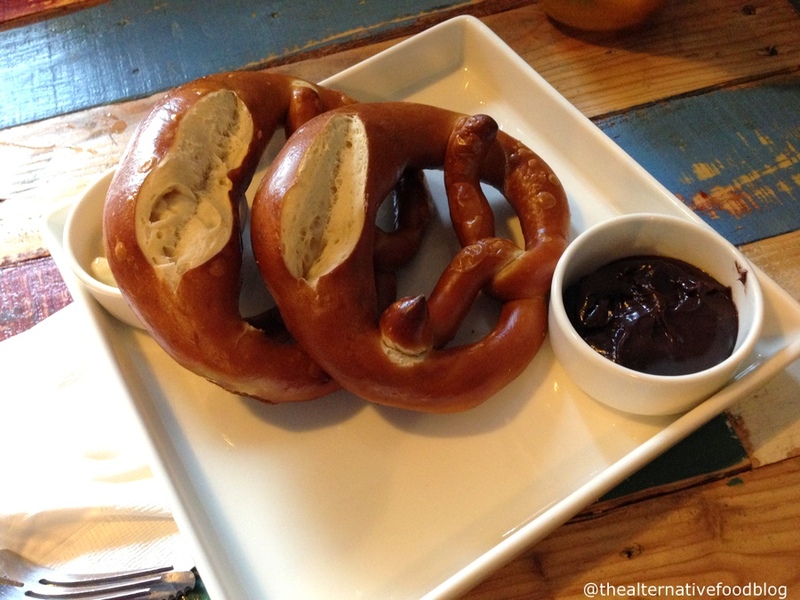 On top of all this, we also tried two sweet dishes namely the Bretzel as well as their Sea Salt Brownie. I am a big fan of bread so I was quite excited to try their Bretzel and it definitely did not disappoint. Kit and I were greeted with two soft and warm bretzels, and a thick dark chocolate sauce as well as whipped butter. It was the first time I had tried whipped butter so I was definitely thoroughly impressed with it. It wasn’t too heavy despite the cream and butter whipped together. In fact, if anything, it was so light that I kept reaching back for more (and not feeling guilty at all!). 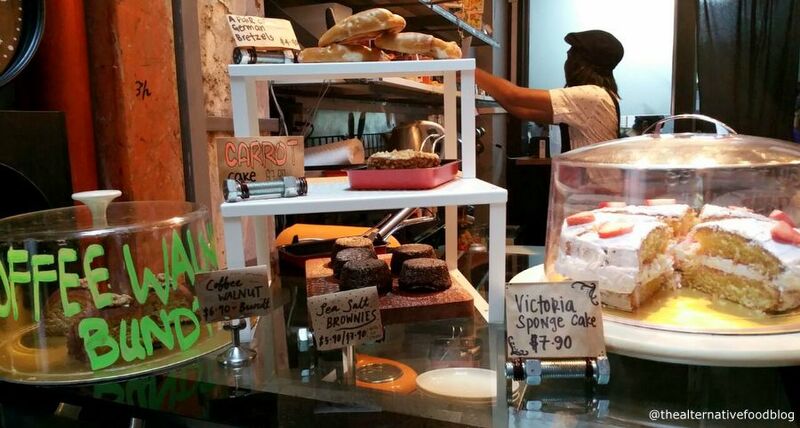 When I placed my order for the Sea Salt Brownie, I learned that The Lab has an in-house baker who prepares their bakes and cakes. These days a lot of cafes outsource their baking to home bakers so it was a refreshing change to hear that their bakes were made in-house. I am a fan of the sweet and salty combination so the brownie hit the right spots for me. How much you enjoy a brownie, like cupcakes, cakes and pancakes, is very much dependent on your personal preferences. Some people like chewy brownies, some like soft and gooey brownies while others like it slightly more firm and cake like. Originally, when it arrived, it resembled a lava cake so much that Kit and I wondered if we’d have a beautiful oozy mess once we cut into the cake. 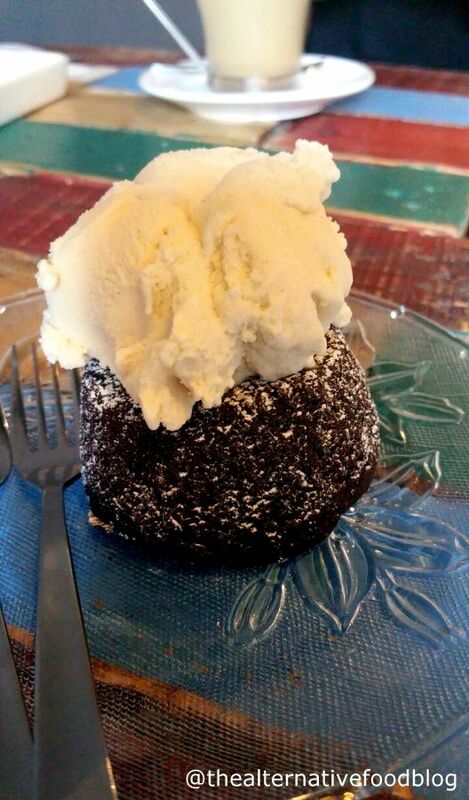 But of course, since we ordered a brownie and not a lava cake, there was no gooey filling. Instead, this brownie is of the firmer variety and initially it was a little hard to cut through but once the brownie had soaked in with the ice cream it became softer. Overall, I quite enjoyed the brownie and I liked the sweet and salty balance of the dish. 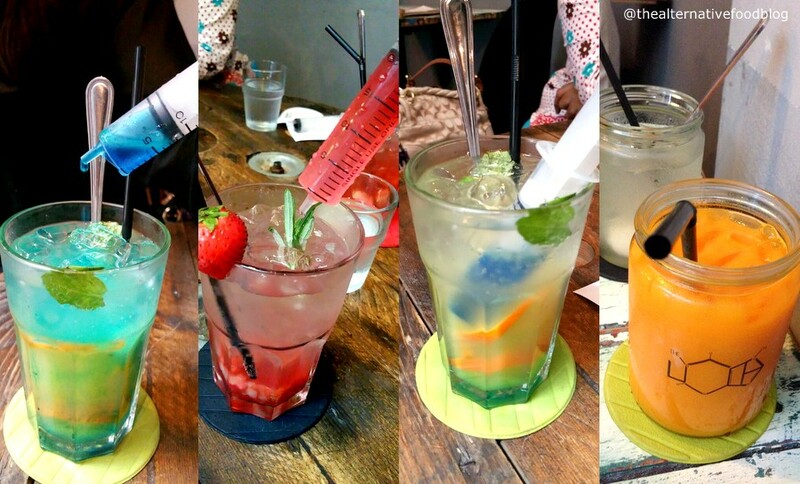 Over the span of three visits, we tried quite a number of their drinks, from their coffee to juices and even their daily concoctions. On both my visits, I tried their juices, Fibre My Dear (SGD $7.00) and An Apple A Day (SGD $7.00) and I really enjoyed how fresh they were. The former is a mix of carrot, orange, pineapple and pear while the latter is a red apple, green apple, celery and ginger concoction. 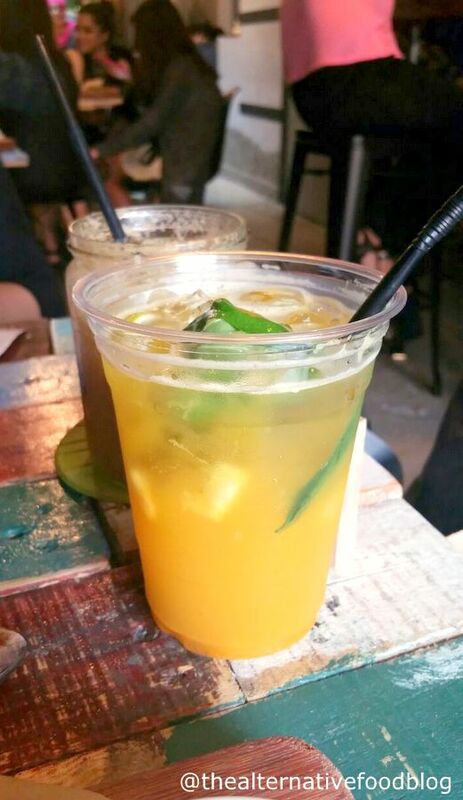 From what I tasted, is is clear that their juices are 100 per cent fresh juice and are made on the spot for you. The juices I ordered were their specially concocted juices so they did cost quite a bit. However, if you want to try juice but don’t want to pay so much, they also have a cheaper option, Off The Rack (SGD $5.00) where you get to pick a minimum of three fruits of your choice for them to blend into a juice. The only set back of this option is that you’re limited to whatever fruits they have on the day of your visit and not every fruit available on that day might be to your liking. On the coffee front, I will admit that when I saw they used Dutch Colony Coffee Co beans, I got rather excited and hoped that they would do the beans justice. True to the quality of the beans, the hot latte I got was lovely. 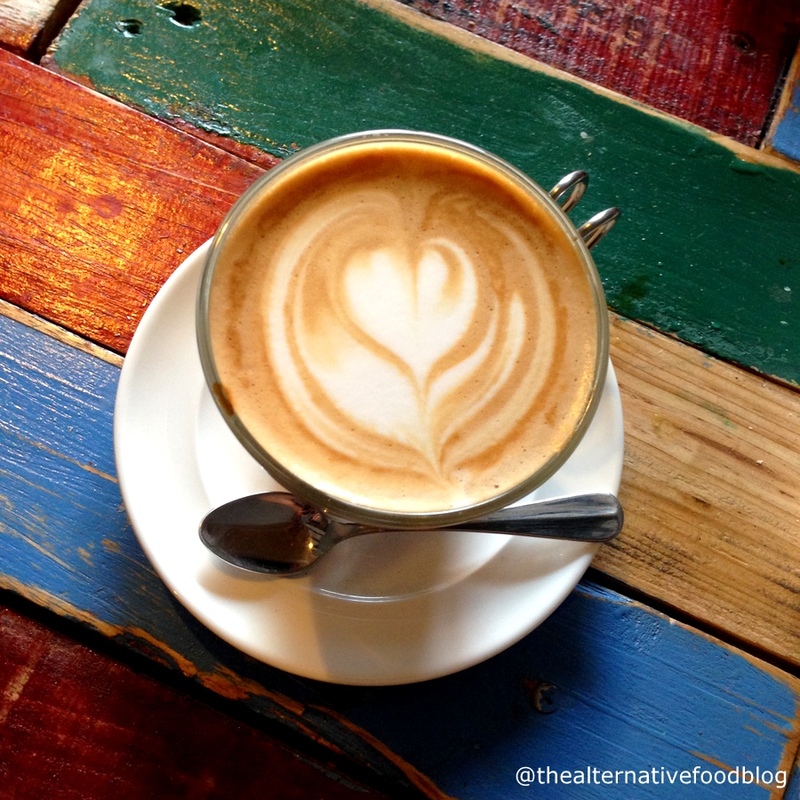 I got the perfect natural sweetness of the beans and the barista made a very well balanced and polished latte. It was definitely a spectacular end to an already wonderful dining experience. As for Kit, she tried a Pear Mango Basil Sparkler (SGD $6.00) from their series of sparklers that feature drinks infused with herbs and fruits such as thyme and strawberries. Kit loves the aroma of basil and she was excited to see a basil-infused drink on the menu. According to her, the basil does not overpower the taste of the fruits in the sparkling beverage, and it was a refreshing and fruity complement to her Black Eye Pea Burger. The sparkler was not too sweet, and for sparklers such as the Heisenberg, the drink comes with a syringe filled with the main fruit flavour and you can choose how much you want to add into your sparkling soda. 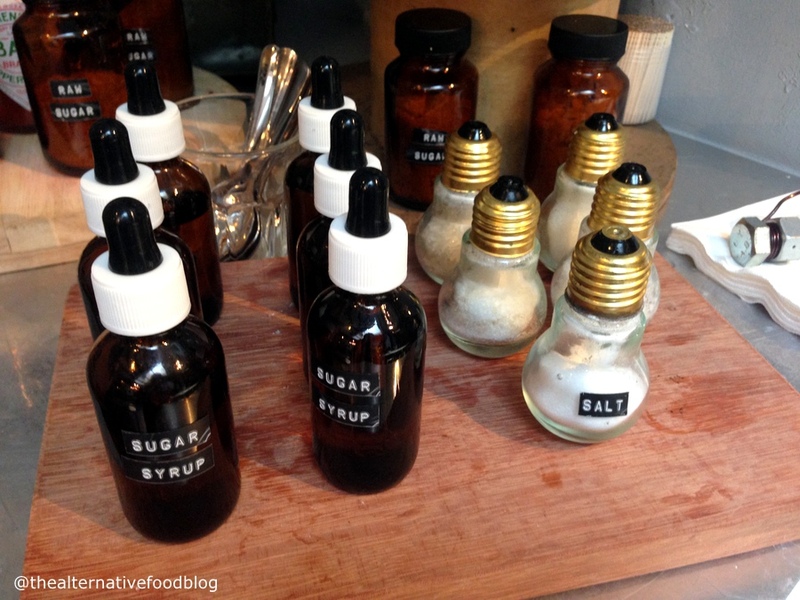 It was truly an “experimental” experience to play with a syringe, adding to the unique dining experience. When we spoke to Ijah, she shared that The Lab had many plans for the future and while I won’t spoil the surprise here, I am looking forward to all that they may offer in the near future. If Ijah had not mentioned it, I would not have known that they’ve only been up and running for three weeks now. Recently, I had lamented to some friends that sometimes, cafe fare becomes too predictable and having tried quite a number of places, I was starting to feel a little sad that things were almost always the same. 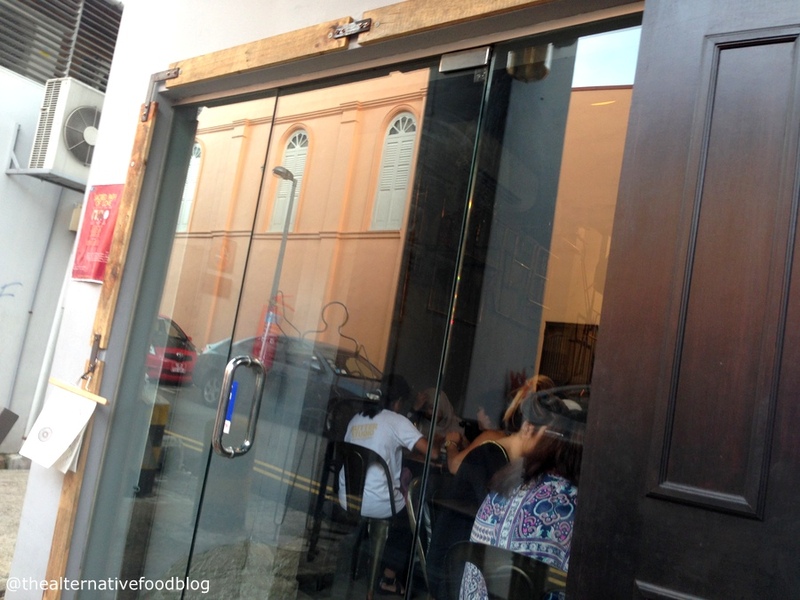 However, The Lab, with their highly experimental style, has opened my eyes to the possibility of a potentially different and unique dining experience and I can’t wait to head back and try their new dishes, when the time arises. Vegetarian Options: Available for vegetarians.